Carved out of iron rafts and flowers: sakura, peony, bellflower. The ropes and flower's stamens are made of gold, dew drops on the leaves - of silver. 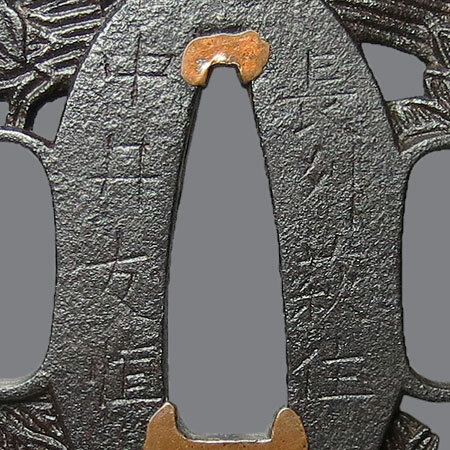 "Hanaikada" pattern was popular in the Momoyama period. Literally it means "flower raft", and expresses the essence of human life. According to Buddha's teaching, everything including our own life flow without stopping. 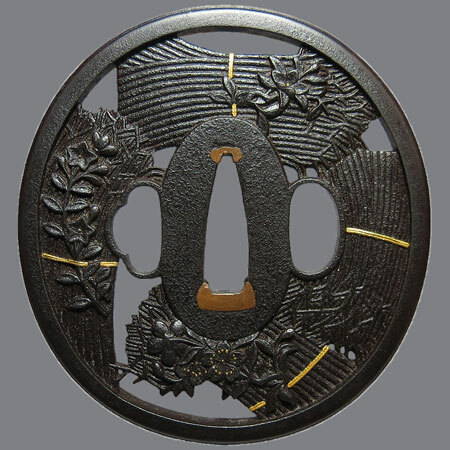 Tsuba is made by one of the three masters of Nakai family, belonged to Choshu school. They lived from the end of 17th century to the 70th of 18th century. Insription: 長州萩住 中井友恒 (Choshu Hagi Ju Nakai Tomotsune). Choshu school. 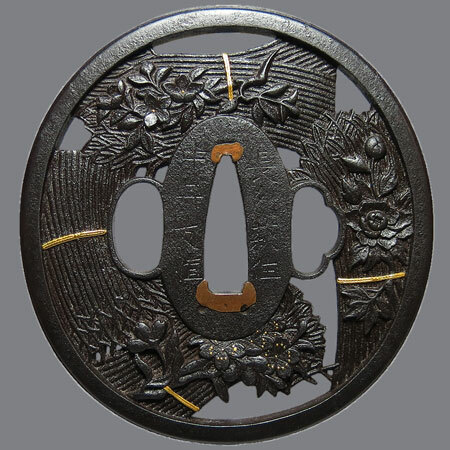 Iron, niku bori ji sukashi, zogan with gold and silver. Nagamaru gata, kaku mimi koniku; 8,0 х 7,6 x 0,4-0,5 cm.